Interested in free books? How about a ton of prizes? Did I mention there’s a grand prize of $175 in Paypal cash? Cash… just before the holidays get into full swing? YESSSS!!! 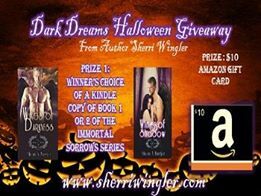 So here’s the deal, there is a huge, multi-author giveaway going on right now all the way through Halloween night. Just follow the link: http://www.rafflecopter.com/rafl/display/2703c98f25/ and you’ll have multiple opportunities to win. Oh, and while you’re here, here’s what I have up for grabs… Good luck!